In advance we wanted to tell you more about some of the beautiful and historic places we will visit while living on Ischia. Here below you’ll find a lovely summary to savor as you start getting ready for your EPIC trip to Italy! The ancient village of Ischia Ponte, also called Village of Celsa for the presence of mulberries, is an ancient village of sailors and fishermen, dating back to the 18th century. Since then Ischia Ponte has been considered the richest and most prosperous municipality of the island. For sure we will visit the famous via Roma and Corso Vittoria Colonna and the beautiful Cathedral of Assunta, built in 1301 and remodeled in 1700. The crypt, decorated with frescoes of Giotto’s school, still preserves the remains of the noble families of the island. Sant’Angelo Ischia, a small fishing village South of the island of Ischia has always had a unique charm because of its combined characteristics of “pristine and primeval.” Key sights include the Tower and the old center which starts from the small square with a bunch of old houses partially restored, that open up like a fan. Sant’Angelo d’Ischia is actually a rock connected to the rest of the island by a thin isthmus and testimony of the island’s volcanic nature. At the top of the islet called the “Tower” once stood a small church where St. Michael, the guardian angel who gave his name appeared in the village. Past the church, you will find Quarry Petrelle where you can cook an egg in less than a minute on the stones. Sant’Angelo d’Ischia is one of the favorite destinations because of its gardens, spas and outdoor restaurants that have maintained the beautiful scenery and above all peace and tranquility, not to mention the beautiful boutiques that offer top quality fashion. This area is also rich in thermal springs and offers beautiful beaches, including that of the fumaroles. Sorgeto is an islet situated in the municipality of Forio, and home to a truly natural thermal park in the open air. Mineral springs, sauna and therapeutical vapours, are one of Mother Nature’s greatest gifts to the island of Ischia. Reachable via sea by taxi boat or by going down 200 stairs from the suburb of Panza, it’s a delight to immerse onself into that mix of warm-cool water with the most amazing sunsets you can image. One of the most charming characteristics of Sorgeto is having a bath here at the night, in the warm waters beneath a starry sky. You can relax and spend unforgettable moments! In Italian: pronounced “Monte Epomeo” is the highest mountain on the volcanic island of Ischia, in the Gulf of Naples, Italy. Reaching a height of 789 metres (2,589 ft), it towers above the rest of Ischia. Much of Epomeo is covered in lush greenery, with a few vineyards also occupying its slopes. Approximately 75 metres (246 ft) from the peak the mountain is covered in white lava. A path leads to the summit of the mountain from Fontana, a quiet traditional village. Thanks to its geo-morphological and climatic peculiarities Ischia provides a unique environment in the Mediterranean Sea, a laboratory in which to appreciate the meaning of biodiversity. From a geological point of view it is a complex mix of several raised and inclined plots, separated by fractures and faults that gave rise to a series of volcanic structures. 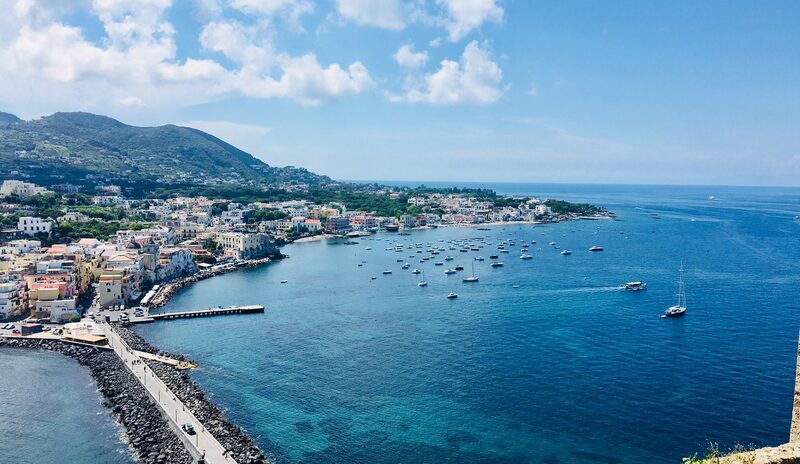 One particularly important event in the island’s geological history is represented by the eruption about 55,000 years ago, when a giant magma chamber formed beneath the present-day island of Ischia. Through cracks and crevices in the earth’s crust, the magma was thrown into the atmosphere and the magma chamber was emptied. The cover of the magma chamber collapsed and the basin that was created in the earth’s crust, called “Caldera”, is where today lies the island of Ischia. Since ca. 55,000 years ago, the sea surface was ca. 150-200 m lower than today, this “Conca-Caldera” was dry land. After the increase of the sea level, the island was submerged for several years. This has meant that the original rock, as a result of chemical transformations, has turned into green grass. New magma flowed in the old magma chamber beneath the present-day island of Ischia, and the cover of the magma chamber began to rise from the sea and bring out the island. This increase has given rise to Mount Epomeo which rises to a maximum height of about 789 m above sea level. The fact that the island emerged from the sea, and from mineralogical characteristics, is also confirmed by the presence of marine clays overlaying the green grass and fossils. The volcanic activity is currently in a quiet phase, and is characterized by the development of very intense hydrothermal springs and fumaroles. The ascent to Mount Epomeo is definitely an experience not to be missed for those who visit. There are many possible paths to reach it. The proposed route, crossing the island from one side to another, will experience some of the geological history – environmental and anthropological aspect of the island. At the top is the church of S. Nicola (from which derives the name of the summit) with its hermitage carved into the stone green spaces, where for years stayed the hermit Giuseppe D’Argout, former commander of the garrison of the Aragonese Castle in 1700. A path carved into the stone leads to the summit, carved by wind and edged with yellow lichen. From here you can enjoy a 360 degree view (from which the origin of the name Epomeo: Epopon or Epopos I look, I aim around). In front of the wood is recognizable Falanga with Santa Maria al Monte, Monte Nuovo and Forio below. The Pontine islands, not so far away, form a continuous line with the Lazio coast. By shifting your gaze to the North Coast you’ll see the Phlegrean islands of Procida and Vivara, Vesuvius, and Lattari mountains and the island of Capri. The Castello Aragonese stands on an islet of trachytic rock linked to the East side of the island of Ischia by a bridge of 220m long. The rocky base is geologically defined as “a dome of stagnation” and is equivalent to a bubble of magna which solidified throughout past eruptions. It is 113 m high under the sea level and stretches on 56.000 square meters. It’s reachable by trekking along a mule path dug into the rock (by Alfonso I of Aragon in the middle of the XV century) or a modern elevator built at the end of 1970s. From this main path, there are other smaller ones linking gardens to the fortress. The elevator is 60m under the sea level and is dug into the rock. The building consists of lands and ruins; original from the XVIII century. The first fortress was built in 474 B.C. by the Greek Hieron I of Syracuse, who came during the war against Tyrrhenian. Other towers were raised up to monitor the movement of enemy ships. At the end of the war, Hieron conquered the Island. It was later occupied by Parthenopeans. In 326 B.C. the Romans took it over and then again Parthenopeans. The looting and the long dominations of the Visigoths, Vandals, Goths, Arabs, Normans, Swabians, Angioini changed the Hieron’s fortress. In 1441 Alfonso of Aragon rebuilt the old Castle, linking the islet to the main island by a bridge and built strong walls and fortifications, where everybody found refuge against the pirate invasions. In the early XVIII century the islet hosted 1892 families, including the Convent of Poor Clares, the Abbey of Brazil from Greece, and the Bishop of Capitolo and Seminario. There were 13 churches for the 7 parishes. In 1809 the British sieged the fortress and drove out the French and almost completely destroyed it. In 1823 the king of Naples fought off the last 30 inhabitants. The Thermal Park has 10 swimming pools with temperatures between 30 and 40 degrees, several hydro-massage jets, sauna, turkish bath, 2 Kneipp pools, private sun bathing pier on the sea with dedicated swimming area. Also available to customers, wardrobe, chairs, sun loungers and parasols as well as several terraces with full exposure to the sun or shade set in a lively and colorful vegetation. 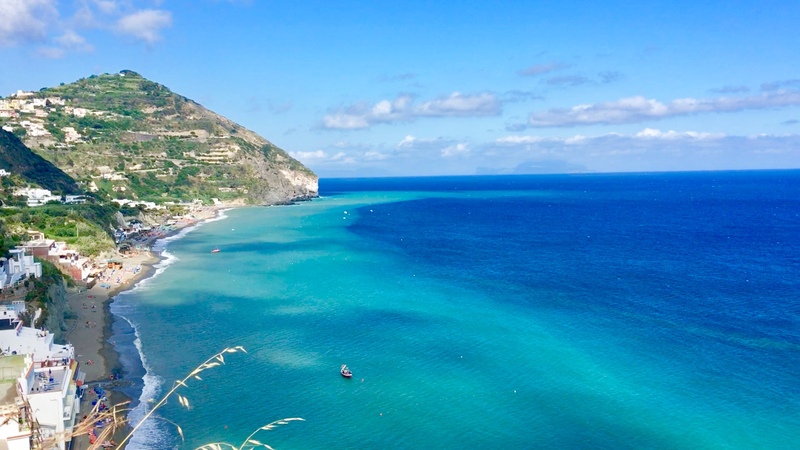 Ischia’s beaches are famous: long stretches of sand between blue sea and the green hills of the interior. 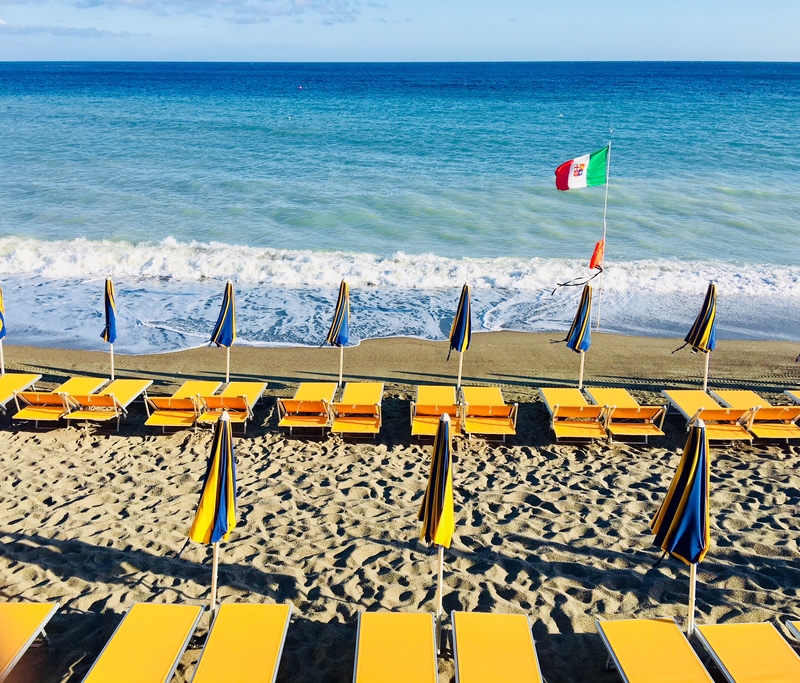 As elsewhere in Italy, beaches are generally divided up into stabilimenti, private businesses who charge an admission price for use of their patch of beach. Some facilities may be included in the basic entrance fee; others will cost extra. Services available generally include deckchairs, sun loungers, towels and changing rooms. There is often a bar or restaurant, meaning you can pass your whole day on the beach, should you wish. However, there are also stretches of spiaggia libera, free beach, which is a more familiar set-up for overseas visitors. Here you can bring your own towels and make yourself comfortable at no charge. There are about 37 km of coastline so you are never very far from a beach. The coastal towns all have local stretches of seafront where you can sunbathe or swim. Ischia’s most renowned beach is the Spiaggia dei Maronti, on the southern shore between Sant’Angelo and Barano. Once, the story goes, it was a favoured landing-spot for pirates who would dig pits in which to bury their loot. As well as good swimming, the 3km-long beach offers the unusual treat of a natural thermal spring at Cava Scura. Open-air pools dug in the rock give visitors the opportunity to bathe in the therapeutic waters.